Hey all! I have been getting a lot of questions lately about artist applications, Rescreatu style, and drawing tips - so to make it easy on all of us, I have put together this resource guide to help you get a better understanding of how the artist job works and how to familiarize yourself with Rescreatu style! If you have questions this guide didn't answer, or would like to know more in-depth about a topic discussed here, please ask! - How long is the training period for new artists? What does it entail? "Training period" refers to the amount of time in which an artist's work must be checked and accepted by a senior artist. You work step-by-step through the process of drawing creatu. The lead artist may redline your work or give you other corrections to make, and you cannot advance until your work has been approved. The training period lasts as long as it takes for the artist to adjust to Rescreatu style. Obviously the more work you do for Res, the more comfortable with the style you will get. There are artists who have been with Res for over a year and are still in training because they do not or cannot dedicate much time to Res. For me, Rescreatu was my full-time job so it only took me a few months before I was doing work that needed very little correction. - After the training period, how is payment determined? Number of pieces completed, quality of pieces? If the artist is doing quality work through their training period, they will be paid for it, you do not have to wait until afterwards (unless you want to). Payment is determined between the artist and Patrick, who is the only person with access to USD payments. Generally, artists are paid per piece of work at their own asking price through Paypal (or in Credits/CP as requested), once the work has been completed. If you are unsure as to how much your work is worth, you are welcome to start low and then ask for a raise as you get a feel for how long it takes you and how much work it is to complete a piece. Most staff ask for a total payment at the end of each month. - What is the workload like? How much are you expected to produce and in what amount of time? The loose rule has always been an expectation of at least one pet per month, or at least 10 items per month (or any other configuration that is similar to this amount of work). 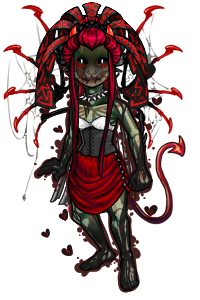 There is plenty to produce for Rescreatu, so artists always have a variety of choices for what to work on, though some projects have a higher priority than others. - How would tasks be delegated between artists if there were more than one active? Would they be split depending on who wants what or would they be preassigned? All tasks are laid out in list format and are divided between departments. An artist wishing to claim a pet or item only needs to make a post with the things they are claiming. As a courtesy rule, artists are asked not to claim more than 3 things at a time so that others are able to have a choice, and also so that the artist does not overload themselves. Once the 3 claims have been completed, the artist is welcome to claim up to 3 more of any remaining work to be done. Work is usually divided between artists by what we are best at. 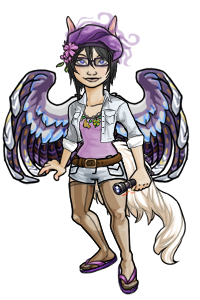 For example, Crowflux is better at avatars so I usually let her do those. 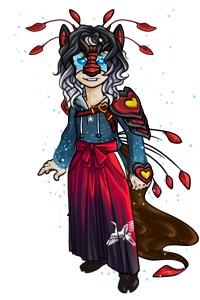 I love to make items with Chimbies, so other artists usually leave those claims open for me. - What things are on the art waiting list as far as Creatu go? Would newer artists be assigned to these things? We have many projects on the back-burner for Creatu that new artists are welcome and encouraged to try. Most consist of effects like Undead and FrostLight. We also have projects with no release date, which are good for new artists to work on because there is no rush to complete it for a certain time frame. Creating new creatu and creatu revamps are generally reserved for senior artists who know the style well. 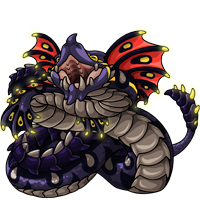 - If there were newer artists, do you think more Creatu or effects would be released? Or would work just stop once we've finished everything that exists now? Undeniably, work would get done faster, but I can tell you right now that even with a fleet of artists, we would not complete everything that needs to be done. 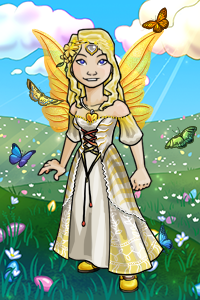 There are endless new colors, creatu, effects, items, wearables, scenery, and features that can be added to Rescreatu through the creativity of our users and staff. The problem with new releases is not that nothing is being produced or that things are not being produced fast enough. We have mountains of finished work that has not been released yet. The problem is the integration of such new things and features to the website. All of that requires hours and hours of coding, which none but two or so staff members even have access to do. I will just say that it is incredibly difficult and tedious to implement anything completely NEW on Rescreatu, no matter how small or simple it may seem, with the way the site is coded currently. - Do artists handle things outside of their application category? I believe you're the only active artist - does that mean you do other things, like items and avatars, as well? Would that continue if there were more artists? 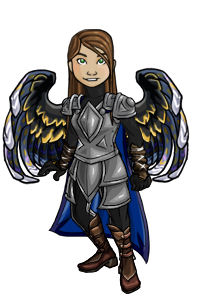 We once had separation of item artists, creatu artists, and graphic artists, but since our team has become so small, all active artists currently tackle a range of art from creatu to items, avatars, wearables, scenery, layout graphics, contest artwork, etc. If you want to specialize in only one or two of these things, you are welcome to, but of course the more you can contribute, the more help you will be! - What do you think the site could introduce with more artists? 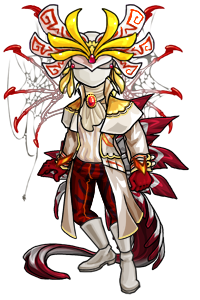 Would you like updates that required a lot more art, like... clothes for Creatu, or Creatu in HA's? Ideally, with more artists we could tackle many more projects at once. We have so many fantastic ideas that are only half completed or rarely worked on because our small team is constantly busy with the most priority items. Since we are always working on what needs to be done immediately, we do not get enough time to work on other fun projects that users have been suggesting for years, such as HA creatu. - Res creatu are semi-realistic and tend to be more on the toony side of the spectrum. They generally have large, cute heads, shorter legs, compact bodies, and large eyes. Remember that they can all be deconstructed into simple shapes. 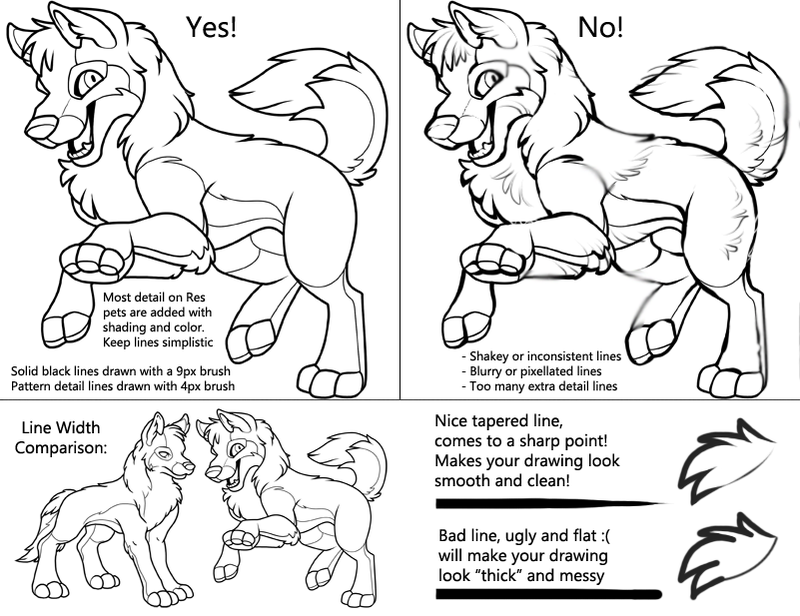 - Res pets use solid, thick lineart. They usually have 2 layers of shading and 2 layers of highlights. Most of the detail is added through shading and color, not lines. 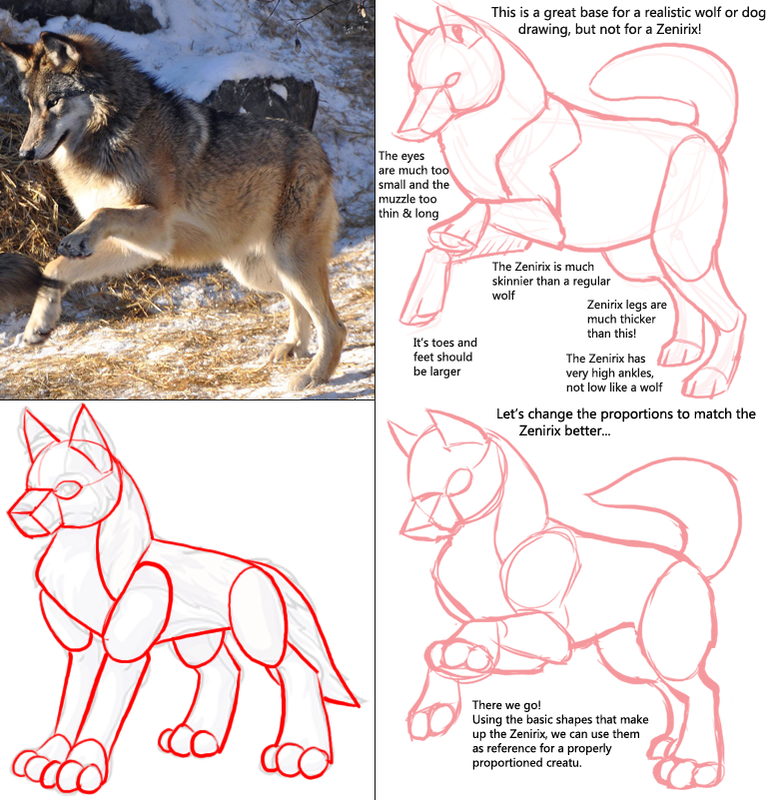 Practice breaking up your animals into basic shapes and shading accordingly. 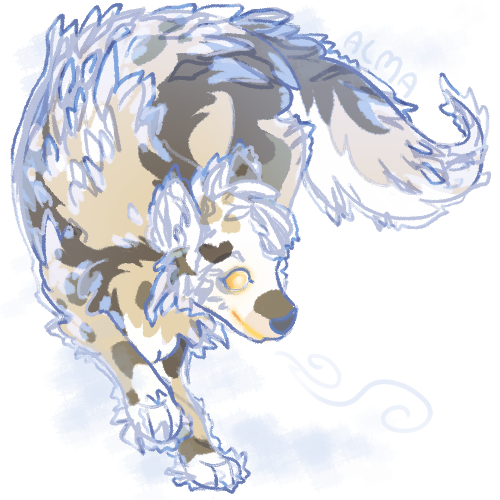 - Try to draw your animals within a small square canvas. This will help you experiment with pose angles you might not have tried before in your attempt to get the whole animal in there without making it look too "boxed-in". 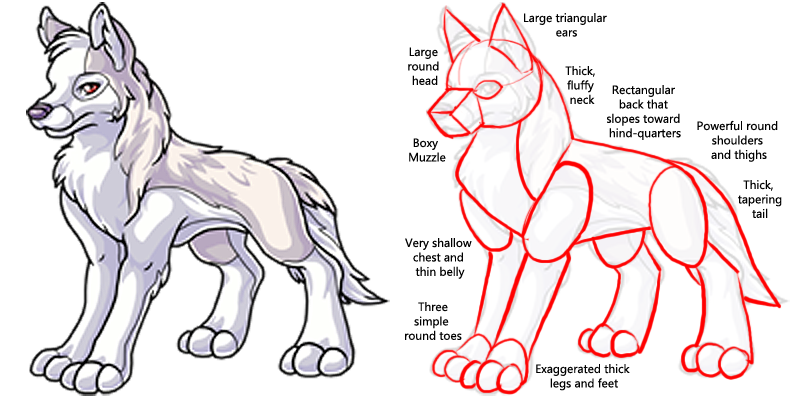 Res creatu are only 200 pixels in size when scaled to site proportions, so try to find ways to make the animal large within the limited canvas space. Maybe shorter legs? Curl the tail around the body? Change the angle of the ears? 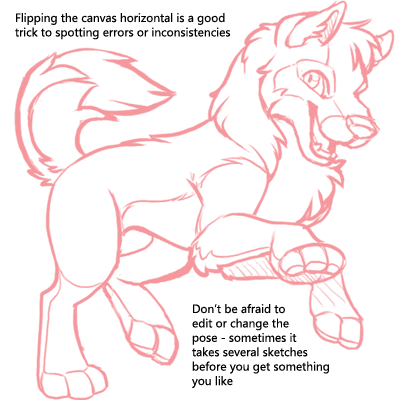 These are all things you must consider when trying to draw a unique pose within a small area of space. They were all drawn on a small square canvas, but they all have unique poses and are large in the small space. You can see some tricks I may have implemented such as curling large tails or accessories up and around the body, angling wings at a certain perspective that make them look spread but don't take up too much space, and moving heads, ears, or feet in expressive, but still compact positions. - Making a virtual pet site graphic is different than simply drawing a nice picture. There are many techniques and methods involved, and it can be difficult to adjust your style and way of drawing. 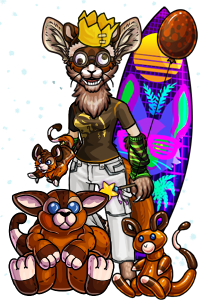 Sometimes you can have a wonderful artist that just isn't cut out for virtual pet graphics. Not being compatible with Rescreatu style does not mean you are a bad artist. Let's draw a creatu step-by-step! Creatu are only 200px large when they are site-size, which is pretty small. 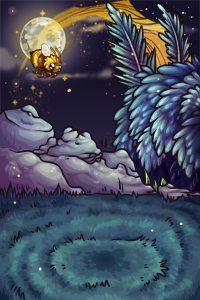 However, final creatu graphics are produced on a canvas ~1667px at 300dpi, which is huge! Creatu files are drawn that large so that they can be used for different purposes if we ever needed them - backgrounds, printing, etc. 1667px is too large to sketch on, and 200px is too small. I like to start my canvas at about 600px - your monitor will be a different size than mine - but I prefer this smaller size canvas because it keeps me from getting too detailed with my sketches. If you add in too many details, they might be too small to see in the final graphic (and it will probably take you a lot longer to draw it, too). That looks a lot easier to draw now, doesn't it? This one is cute! And look how nice and square the pose is, too - it will fit nicely in our square canvas. 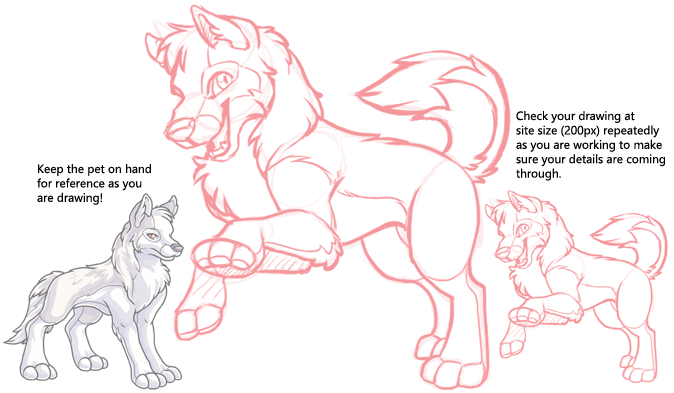 Now that we have a good base for our creatu, let's refine the sketch and add in the details. Let's move on to lineart! Now we must increase our canvas size to match with Rescreatu's high-quality files. 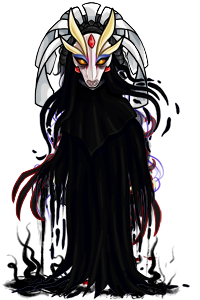 Creatu are drawn in 300pdi on canvases that are about 5.5 inches (1667px). You will want to use an 8 or 9 size hard brush at this scale, and if you prefer to work with images even larger, make sure your brush is sized accordingly. To make sure your lines look consistent with Rescreatu pets, use the method described earlier by resizing your image down to site-size as you work. If your lines look too thick or too thin at 200px, you need to change your brush size. Creatu are drawn with thick, even lines. Using a lining tool or turning off pen pressure is good for making nice consistent lineart. Now comes coloring! I'm sure I don't have to tell you how to do that ;) This is a Rescreatu style tutorial after all, not a coloring tutorial! You are free to color, shade, and set up your files in the way that you like best, but remember to keep your layers orderly and your files clean. You might need to collaborate or other artists may need your PSD files for other uses such as recolors, or effects and revamps. Make sure your methods can be replicated and your files can be reworked by any artist. Here's what my layers look like after coloring: labelled and organized! When you get to shading, remember those shapes! 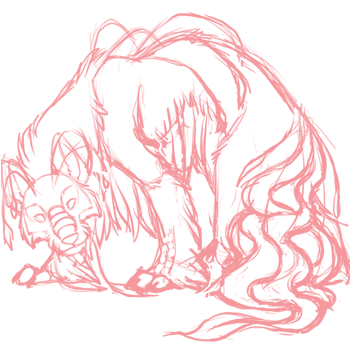 Deconstruct your drawing back into simple shapes and shade your creatu one part at a time. Creatu usually have 2 layers of shading and two layers of highlights. Here we are beginning the first layer of shading. I find it helpful to place a gradient background- this helps you keep a consistent light source and acts as a reminder of which direction your light is coming from. I also use two very contrasting colors to shade (blue & orange) so that I can get a very clear idea of what is hitting the light and what remains in shadow. Shading is the part where you get to add in all of the fun textures like fur tufts and scales that you weren't able to add in the lineart stage. 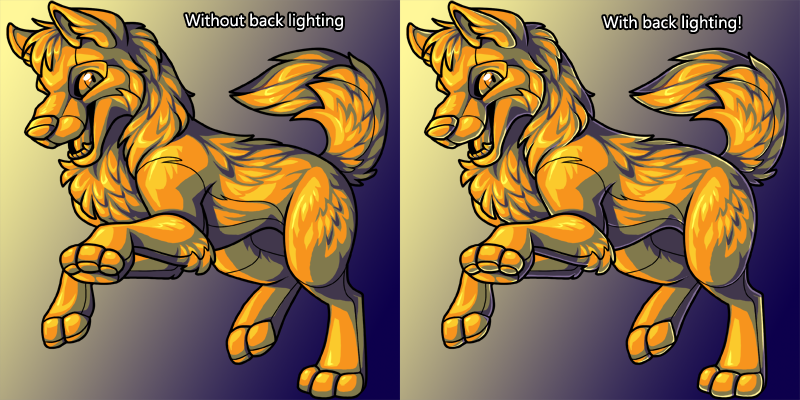 I personally prefer to erase away shadows, I think it helps "sculpt" the pet into the light, and it keeps shading where you might not have considered placing it, but you might prefer to draw your shadows in! If you are having trouble shading on such a large image file, try zooming out to a comfortable distance and using a larger eraser. You may find it easier to block in all of the shading first, and then zoom in to smooth it all out. Rescreatu pets use sharp cell-shading, no gradients or soft shades. 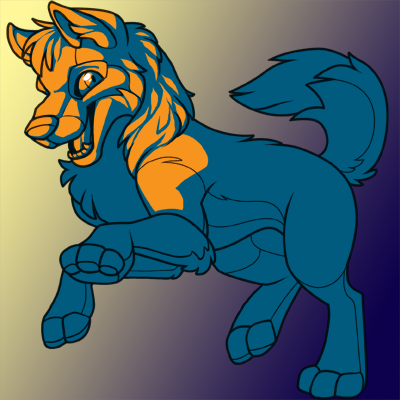 Remember to keep the toony & simplistic style of Rescreatu in mind! Things like fur and hair are shaded in tufts or clumps - not strands. Here is our finished base 1 shading. Try not to put too much texture into it - a few fur tufts here and there is fine. Even more detail will be defined in the subsequent layers of shading and highlights, so we don't want to go overboard with detail at this stage. Now it's time for the second layer of shading. Let's turn down the opacity of our first shade layer and choose a darker color. This layer is reserved for the darkest parts of the creatu, parts that are overcast with shadow or to help add some definition between things like fur tufts, teeth, and toes. 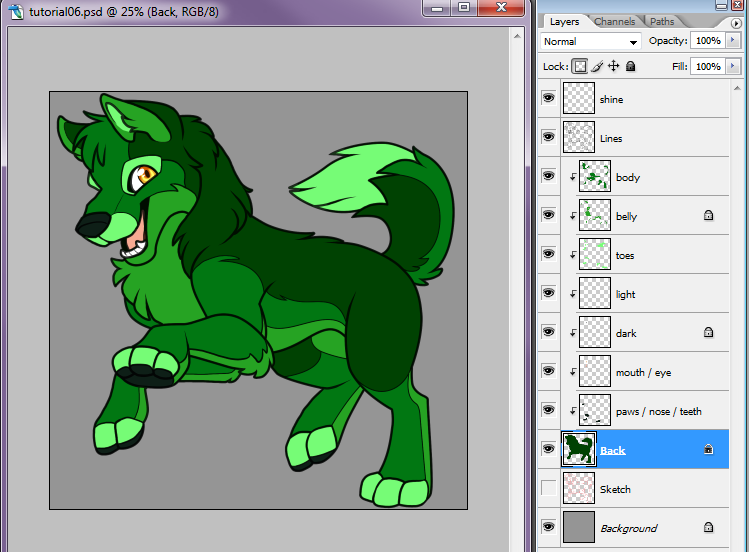 For this layer, I switch back to drawing the shadows in instead of erasing them. Be sparing with the second shade layer, use it to help define the detail you established in the first shade layer but don't overdo it! Sometimes a third layer of shading is needed if your pet has very very dark areas or large areas of shadow. I think this graphic is fine with just two. Now make a new layer for highlights. 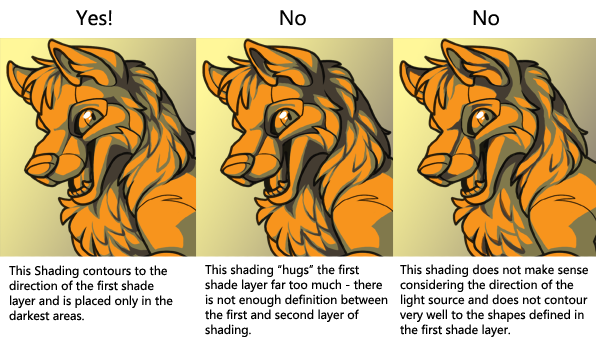 Like shading, there are two layers of highlights (potentially more if necessary). Highlights tend to be full and geometric, not thin and delicate. Think about where the light would hit the creatu and depending on the texture, what kind of shape it would make (that's right, you can't escape those shapes!). Just like when you were doing the second shade layer, be careful about overdoing it and only put highlights on the brightest part of the creatu! If you add too many highlights, your creatu may look too shiny or even wet, and it will take away from the shadow and depth of your drawing. 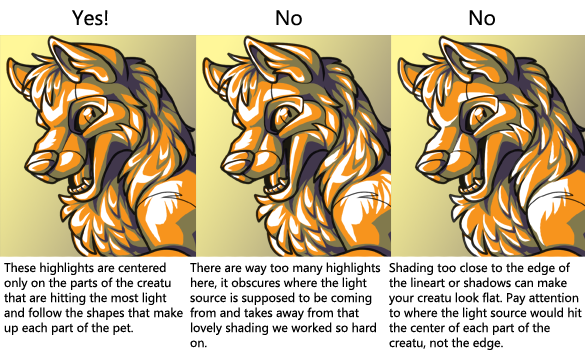 Also be sure to "center" your highlights - placing them right against the lineart can make your drawing look flat. The second layer of highlights is very easy. This layer is just for adding that final shine on all the brightest parts of the creatu. Use it sparingly! Once again, add further layers of highlight if your creatu needs it. Whew, we are almost done! Now we must do the very last drawing step - reflective lighting. Reflective light, bounce light, or back light, is the thin strip of highlights you can see in the darkest areas of shadow, especially on reflective objects. Rescreatu style utilizes this technique to make details in the graphic "pop" for a nice clean image. Some artists prefer to add back lighting by erasing their shading layers around the edges, I prefer to do this step on a new layer with white lines set to "overlay". Find the areas of shadow in your drawing, and draw some highlights along the inside edge of your lineart with the same size brush you used to do the lineart. This helps bring details back out that might otherwise get lost in shadow. 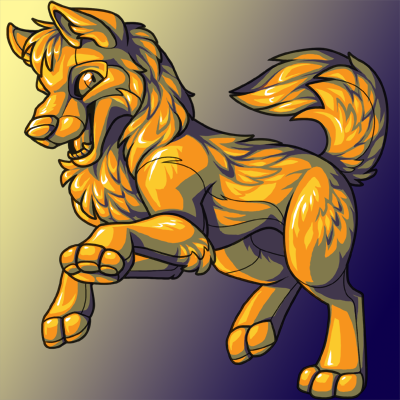 Don't get too carried away with it or you might accidentally make your pet look like it's glowing! Once you are done, set this layer to "overlay" and look at all those crispy details pop! Now we can finally put the whole thing together! 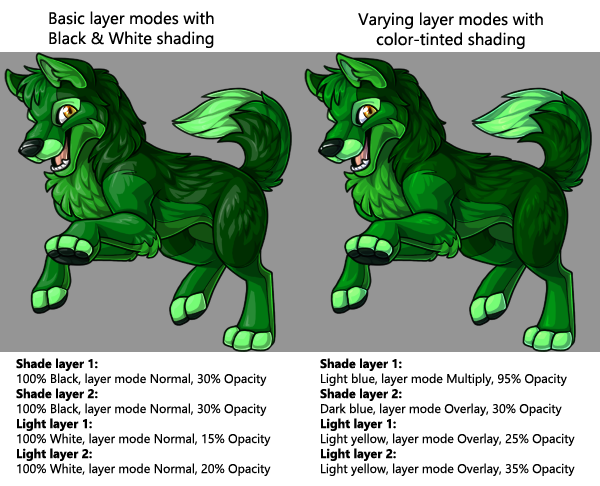 Everyone prefers to set up their layers a little differently, but most people prefer to use layers set to "overlay", "soft light", and "multiply". Soft Light is good for highlights and lighter colors, Multiply is good for color-tinted shadows, and Overlay is a good layer setting for both shading and highlights. Play around with different layer settings, colors, and opacities to get the effect you want. Using color-tinted shadows and highlights in your art helps bring life and atmosphere to the picture, only using black and white can make your image look dull! Resize to 200px and save as a separate image. 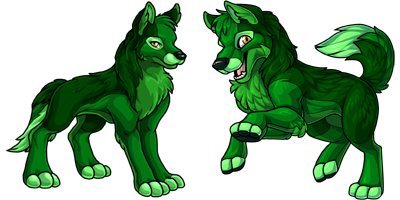 If you are doing recolors of the pet, it is easiest to save a PSD for each color to keep the file size small and so you are always able to go back and edit a coloration if you need to! 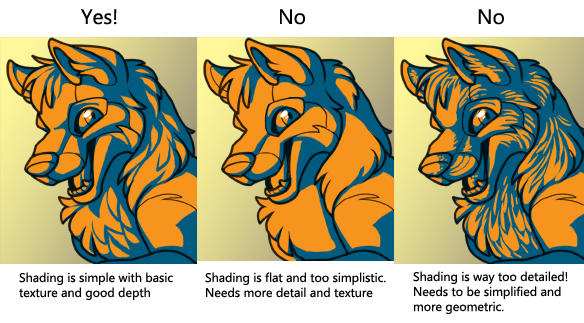 Don't forget to edit your shading and highlights' opacity and color for every recolor you do - blue shadows might look great on Azure but terrible on Lemon! 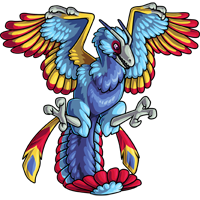 Now we will take a critical look at some sketches of Rescreatu pets and, using all of the information and tips we learned from above, see how they could be improved! 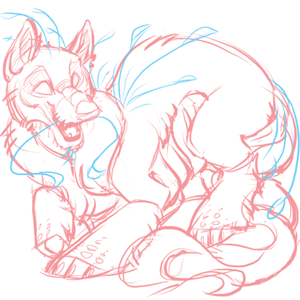 Here is a beginning sketch for a Liyure graphic. It is a good starting point, but several things could be reworked. 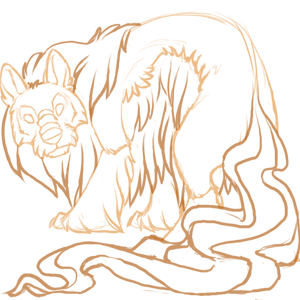 First of all, the proportions aren't quite correct - the Liyure has a very long, ferret-like body, the body in this sketch isn't quite long enough. It's legs are also much too long, and it's head is very small. The entire creatu is also centered on a single plane across the canvas, look how much unused space there is at the top and bottom! Here is a reworked version of the sketch above, much better! The creatu now fills the whole canvas space, and instead of being spread out across a flat plane, it is now situated at a much more interesting perspective. It was also simplified into easier shapes and given more Liyure-like proportions. Not every part of a creatu needs to be visible all of the time - think of how layering body parts can conserve space within the canvas and create depth. Here's a great drawing of a Berrok, but notice how that one outstretched paw is elongating the drawing? By picking up that paw we can use more of the horizontal canvas space! It also gave the Berrok some nice attitude and small changes to the body posture gave the pose more personality. Even small changes can make a big impact! Here we have another Liyure. CS Creatu can be difficult to fit inside of a small canvas without them looking "boxed in" because they are so elaborate. This may make it hard to come up with original poses, but there are a few things to keep in mind that will help you. Firstly, try to stay away from flat profile views, more often than not this makes for an uninteresting pose. You can see in the first drawing how the head profile is taking up space on the canvas, making the body and tail feel squished into the picture. By rotating or turning the head back towards the body, we now have a lot more room to work with! Don't forget about layering either, the second sketch has a much better sense of perspective and depth because of how various body parts are overlapping others. Creatu that have long legs or bodies don't always have to be outstretched! Curling them up and bending legs give a nice sense of energy to your drawing - look how much more energetic the second Liyure is compared to the first! Here are some speedpainting videos of creatu I have drawn in the past that might be helpful! If any other Rescreatu artist would like to contribute to this guide, it will be posted here. Thanks so much for reading, I know this is a long one! I would love to hear questions and comments if this guide helped you in any way, or if you would like to know more about a certain subject. 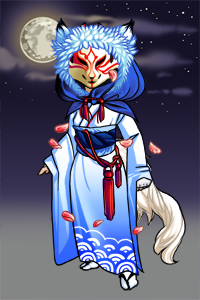 @Zen: Those items are super cute and they honestly looks just fine to me, even the one you plan to redo! @Loki: Ahh adorable! You definitely have the right idea going. 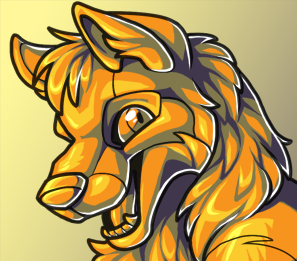 I'm not sure what program you are using to draw, but those lines and edges are looking a bit too pixelly and "MSPaint-y" compared to the slightly softer edges you get in programs like Sai, PS, and Firealpaca. @Todeo: I know Todeo.. its happy and sad for me at the same time :') But I'm not leaving Res! Just the staff team. @Nova: Tapering happens automatically when drawing normally with pen pressure on your drawing tablet. Sometimes the lines are not as tapered as they could be though, or maybe you like to draw with pen pressure turned off for nice bold, consistent lines. All you have to do is take the eraser tool and just erase the end of the line to get a nice sharp point. You mention Rescreatu Artists helps a little in every field. Is there a certain style or way Rescreatu are seeking how their banners and avatars are suppose to be done? I know 3mmique was hire as Rescreatu Graphic Artist so I was just curious if you had any information or knowledge of that. These are the avatars that 3mmique has done, just to give you an idea. They have a cover a very wide range. 3mmique does not do any other (pet, item, HA) art. I guess you have to be flexible and very well attuned with Photoshop as well as she also did the Spring banner shown below. Followed shading and lighting steps as well as backlighting, I need to work on anatomy in general but this one was pretty much heavily referenced from a wolf stock photo. @Tiffany: (Thank you for posting those examples, Wolf!) Pretty much what Wolf said, 3mmi specializes in avatars because she happens to be very good at them, can cover a variety of styles, and can do them quickly. 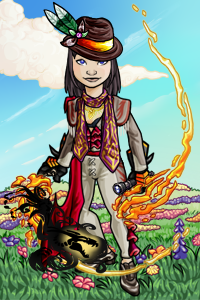 Avatars and banners are not usually in enough of a demand to warrant an entire position for them, so they are usually just put together by artists (most of the buttons and banners you see for events are made by crowflux). Of course nothing is stopping you from applying to help out! And if you were not interested in monetary pay, you could always ask for Cash Points instead. @Wolf: That looks fantastic and very promising! You have some really nice fur textures going on, especially in the neck area n.n My only suggestion (for the body/belly area) is that texture in shadow is usually accentuated by even darker shadows, not by highlights (though it does make an interesting underlighting effect). Hey :)! I'd like to try out to be an artist for the site, how do i sign up? Do i just send an email through the link provided? I was just curious as if Rescreatu needed a new graphic artist? Here's a small list of my portfolio work, I'll be doing the res style soon! Hope to hear back from you guys soon! Guys a lovely member of the staff has pointed me to the correct place to apply if you still wish to! @Kina: You are welcome to apply as a graphic artist! Whether or not we "need" one, we are always willing to look at applications that are sent in.